Set mesh object element color (itetclr) and create child points at interior interfaces. This command can also be used to set the node color from the element color. Note color values must be an integer number greater than 0.
settets and settets/color_tets detirmines the color of all elements using the following tests; If the element contains a non-interface point, the element color is set to this value. If the element is comprised entirely of interface points, the centroid of the element is calculated and the material region containing this point is determined; the element color is set to this material. If the centroid of the element is not in any material region, the centroid must be on an interface surface. In this case all vertices of the element are examined and the material common to all vertices is selected as the element color. settets / parents has exactly the same behavior as settets except that existing values of itetclr are used for elements containing non-interface nodes. settets/newtets has the same behavior as settets except that existing positive values of itetclr are not changed. settets/normal assigns the itetclr array of a triangle mesh to an integer value depending on the normal vector direction. There are 26 possible direction that correspond to the 6 faces, 12 edges and 8 corners of a cube. In general most triangles will be assigned one of 6 values which correspond to the 6 sectors which are within degrees of the 6 unit vectors: 1 0 0 , 0 1 0 , 0 0 1, -1 0 0, 0 -1 0, 0 0 -1. See image and table below. NOTE: Valid for a quadrilateral or triangle mesh. 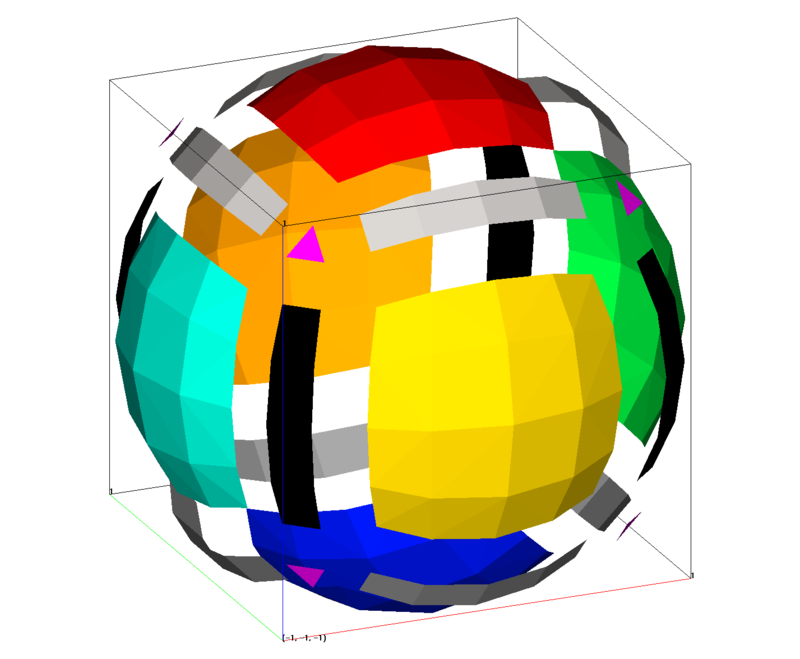 Creates a sphere shaped triangulated surface with colors 1-26 based on normal directions with the view set so the min x,y,z coordinate is left,front,bottom. Direction numbering starts at bottom then top then right, back, left, front as shown in table and image. Image shows triangle elements colored by 26 normal values. Image materials are expanded to show all.